Have you experienced a false awakening? You wake from a dream, perhaps to write the dream down - and then wake again, to find there is nothing in your journal because you were writing in another dream. In the lucid dreaming literature, false awakenings are often called "pre-lucid" experiences, with the implication that they may be failed lucid dreams because the dreamer failed to become aware that he or she was dreaming. There are bigger things going on. In dreams, we awaken to other orders of reality. When we wake up in our regular bodies, we may have fallen asleep in another world. Sometimes, lying in the drifty state near sleep, I sense that as I grow drowsy, a second self, back to back with me on the bed, is stirring awake, ready to prowl. I'm intrigued by nights in which we slip from one dream into another, as if moving from an outer to an inner courtyard. Sometimes the shift is marked by the experience of falling asleep in one dream and waking up inside another. Or, coming back from an inner dream, we awaken inside an outer dream. When we mistake the outer dream for external reality, we talk of a "false awakening". 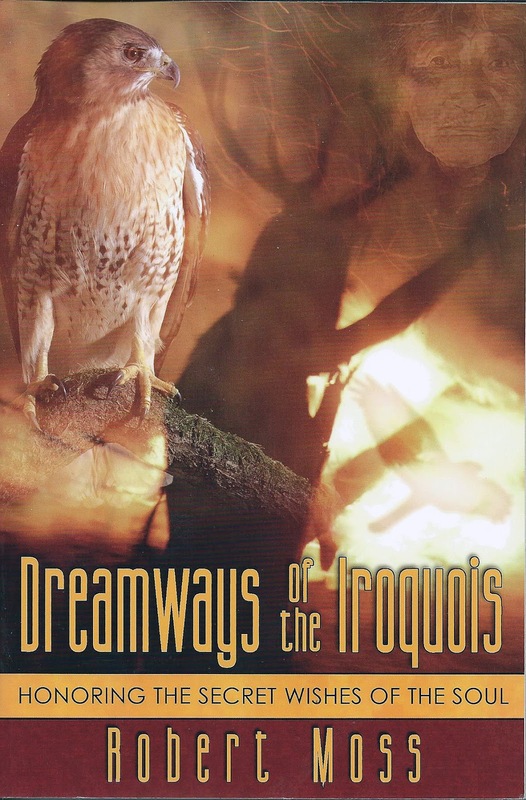 In one of the big, life-changing dream adventures of my life, I woke from a dream in which a sea eagle, an aquatic raptor native to northern Australia, my native country, and to northern Scotland, the country of my paternal ancestors, flew me across an ocean to a profound experience of contact with Aboriginal elders and their Dreamings. In high excitement, I proceeded to recount the dream to a gathering of dream researchers at a conference of the Association for the Study of Dreams (as it was then called). I noticed, as I spoke, that the lecture theater we were in was too formal and structured for my taste, with desks bolted to the floor in steep banks. I did not notice, until I woke again in my body in the bed, that I was still dreaming. There was a double follow-up to that dream sequence. First, I checked with the ASD on the venue for a presentation I was to make at a forthcoming conference and found that I had been assigned a lecture theater very similar to the one in the outer dream; thanks to my dream advisory, I was able to have the venue changed to a more informal space more suited to dream experiencers. Second, on a visit to Australia I had not planned at the time of the dream, I found myself in contact with Aboriginal elders who confirmed things I had seen in the inner dream, and opened sacred space to me because I came to them with the right dream. Experiences of this kind can awaken us to the important fact that there are many levels of dreaming. As we develop the practices of Active Dreaming, including the ability to embark on conscious dream travels and to attain and maintain lucidity during our nocturnal excursions, we will learn that we can go with intention to successive levels of dreaming. Our design then becomes to bring back more from the innermost dreams, where the greatest treasures are to be found, but may be lost to memory as our dream selves wend their way back to the surface. In a program I led for sixth-graders, we were all seized with admiration for a lovely young girl who narrated a night in which she passed through seven successive dreams, nested inside each other, until she found herself in an epic of love and danger in the time of the American Revolution -and then traveled back, level by level, through the outer courts of dreaming, with exact and vivid memories of the whole adventure. Part of our practice, as active dream travelers, is to learn to recognize personal markers that we are moving from one level of dreaming to another. Some dreamers have familiar places of transit; favorites include a locker room (a place of changing, when we think about it), a bathroom, an Eastern restaurant, grandma's house. Some of us have the frequent experience of going up or down successive levels in a building with many floors, or an elevator that works rather differently from a regular lift. Shifts from color to black and white and back again may denote transits between different levels of dreaming as well as different locales. Taking off or putting on clothes, or changing vehicles, may be another marker of switching levels. To get to higher levels, we may need to move beyond the astral body (in which we engage in many of our dream adventures) to a more subtle vehicle. When you monitor jumps from one dream scene to another and get into the habit of asking "How did I get here?" in the dream as well as after it, you are on your way to becoming a traveler who can move fluidly from one level of dreaming to another. Back to the issue of the "false awakening", in which we wake from a dream only to find - when we wake again in the physical body - that we were still dreaming. In an evening in a class, I suggested that although I could not prove whether or not I was dreaming at that moment, I might be able to establish whether I was in a physical body. To dramatize this point, I took the candle from the center of the circle and dribbled hot wax onto the web between the thumb and forefinger of my left hand. As I felt the pain, I announced to the group, "I think I have established that whether or not I am dreaming, I am in a physical body right now." Then I woke up in my bed. I felt the residue of the heat and pain in my left hand, a dream hangover effect that is sometimes called astral repercussion. Growing consciousness and discernment about these things is a matter of practice, practice, practice. The reward is to become a more conscious citizen of the multiverse, awake to the fact that our ordinary lives are related to grander stories being played out, right now, in other orders of reality, able to draw from this the will to choose how we navigate life on all levels. A nod to neuroscience: Like lucid dreams and vivid dreams in general, false awakenings seem to be most common in the early morning. Those who link states of consciousness to brain functioning would note that this is when there is an increase in subcortical activity associated with the circadian cycle. Art: Salvador Dali, Figura asomada a la ventana (1925). 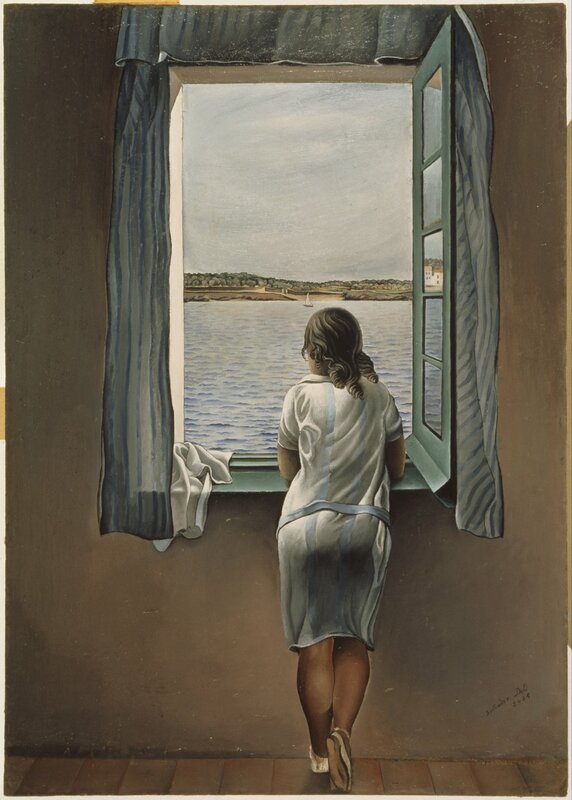 Beyond the girl is the bay of Cadaqués in Catalonia, where Dali summered. Garcia Lorca, who also stayed here, said that life in Cadaqués was like a dream. 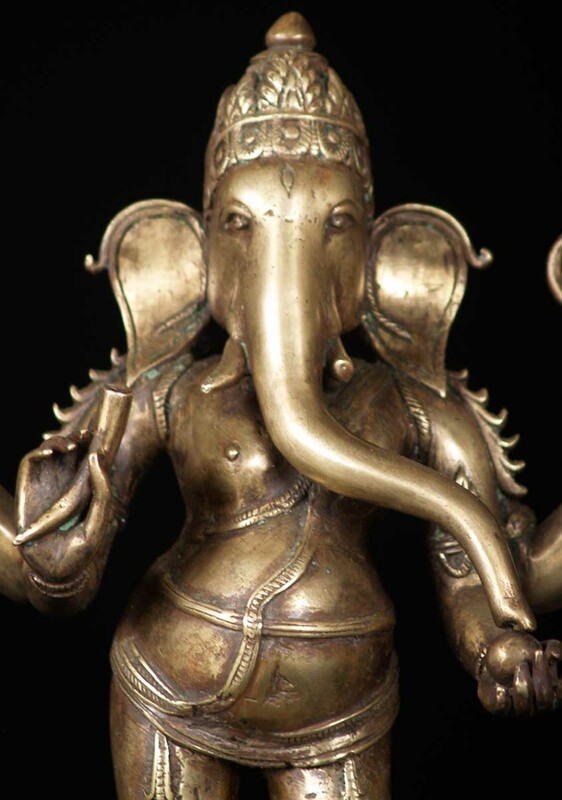 As many as are the aeons, so are the ways in which Ganesha's story is told. How do you get a god to write down your stories? It is said, Lord Ganesha, that you agreed to take dictation from the sage Vyasa after he set his mind on you in deep meditation. Did you agree because you knew that what was coming was a thing of epic proportions? Or did you suppose it would be something short, a poem to pleasure a goddess floating in a lotus pool? Were you persuaded because the declared aim of the Mahabharata is to turn human minds away from war, to demoralize demons and soothe angry nagas? Or were you eager to binge on action movies, with the clash of armor, the delight of rounded dancing bodies, the tricks of war magicians? When we think of inspired writing, we picture the human with pen or laptop as the one with the tiring fingers and aching buttocks, and the god – or muse – as a refined being fluttering overhead, whispering lines. Here the situation is reversed. The human inspires, the god takes it down. There was a deal, and a deception. You made it your condition that Vyasa must never pause in his recitation. He must deliver the whole epic, verse by verse, all the way to the end. No room for hesitation or contemplation or even a snack or a pit stop. He agreed, but then he tricked you. He requested that you should only record his lines when you had grasped their meaning. Being a god, you thought this was a meaningless condition; how could you fail to understand the mouthings of a mortal? Vyasa was subtle. When he needed a break, he gave you verses so exquisitely complex and opaque that you had to stay your hand until you figured them out. Sometimes this required you to survey a hundred worlds in the knots of Indra’s net. So Vyasa never lost his thread. He went on so long that your tools were exhausted.. When the last feather pen snapped in your fist, he was still singing the doings of gods and demons, ascetic kings and lascivious maidens. You kept your side of the deal. You broke off a tusk to write down the last lines. So tell me, Ganesha. How do I call a god to write my story? Must I allow my hand to be your hand? Must I sacrifice something as precious as your ivory tusk to complete the work? I bring you sweet cakes and ripe fruits. They say your mother Parvati molded your body from sandalwood paste. I am dabbing sandalwood oil over my collarbones, and at my third eye. If I become you, Divine Scribe, then whose mind will dictate what I record with my hand? Great humor often sparkles on the surface of a dark tide of challenge or tragedy. Mark Twain, still America's most beloved humorist, was stricken by many terrible events in his life and that of his family - the loss of a beloved brother and later his favorite daughter, the loss of all his money late in life, forcing him to start over - yet generally managed to come back laughing, and making the rest of us laugh. His ability to laugh his way through did not mean numbing himself to tragedy. Sam Clemens (who adopted the pen name Mark Twain) dreamed the death of his younger brother Henry before it took place, in exact detail, and this haunted him for the rest of his life..
Sam and Henry were set to embark together on the riverboat Pennsylvania, Sam as apprentice pilot, Henry as a lowly “mud clerk”, given food and sleeping space in return for helping out at places on the river where there were no proper landing sites. The night before they sailed, Sam dreamed he saw Henry as a corpse, laid out in a metal casket, dressed in one of his older brother’s suits, with a huge bouquet of white roses on his chest and a single red rose at the center. Family members urged him to dismiss his terrible dream; after all, it was “only a dream”. Though the force of his feelings told him something else, Sam agreed to try to put the dream out of his mind. The tragedy began to unfold soon after the two young men boarded the Pennsylvania. The pilot of the Pennsylvania, William Brown, was an autocrat with a violent temper with whom Sam was soon scrapping. During the voyage downriver, Sam got into a full-blown fight with him. The captain sided with Sam, and said they would find a new pilot when they got to New Orleans. But a new pilot could not be found and since Sam and Brown could not coexist on the same boat, Sam was transferred to another vessel, leaving Henry on the Pennsylvania, which started the upriver journey fist. Just before they parted company, Sam and Henry discussed how they would act in the event of a riverboat disaster such as a boiler explosion, which was a common occurrence. The Pennsylvania’s boiler exploded in a hell of steam and fire, in the way they had discussed. Badly burned, Henry survived for a few days, to die in Memphis, where the injured were carried. His handsome face was untouched, and the kindly lady volunteers were so moved by his beauty and innocence that they gave him the best casket, a metal box. When Sam entered the “dead-room” of the Memphis Exchange on June 21, 1858, he was horrified to see the enactment of his dream: his dead brother laid out in a metal casket in a borrowed suit. Only one element was missing: the floral bouquet. As Sam watched and mourned, a lady came in with a bouquet of white roses with a single red one at the center and laid it on Henry’s chest. Mark Twain kept telling and retelling the circumstances of Henry’s death, in his mind and in his writing, for the rest of his life. 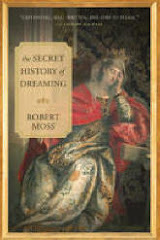 He was one of the first to join the Society for Psychical Research after it was founded in London in 1882 in the hope that its investigators could help him understand the workings of dream precognition. He could never escape the thought that – had he only known how to use the information from his dream – he might have been able to prevent Henry’s death. When I described this episode in a lecture, someone asked, "What's the use of dreaming the future if you can't do anything about it?" My response: any future we can foresee, whether in dreams or though intuition or careful analysis, is a possible future. We may be able to change the odds on the manifestation of a future event, reducing the likelihood that something unwanted will happen, or improving our chances of securing a happy outcome. 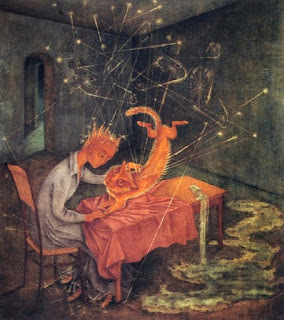 Ask, of any and all dream material: Is it remotely possible that something going on in this dream could manifest in the future, literally or symbolically (or both)? If you can get your head back inside the dream, you may be able to get clarity on the when, where, how and who of a possible future event. If you think of a dream as a place you have been, it's not too hard to understand that because you have been to that place, you might be able to go there again. When you succeed in reentering a dream space, you are not confined to your first memories of the dream on waking, which may have been muddled and fragmentary. You can enter other, related scenes and bring back much more data. If you now feel sure that your dream revealed a possible future, you want to to take definite and appropriate action to head off an undesirable future event, or to bring through possible good fortune. The action plan may range from getting a health checkup to being extra cautious at a certain road intersection, to checking up on your financial planner, to sharing dream information with another person to whom it may relate. Some cultures teach rituals for containing or taming an unwanted future. I am intrigued by an apotropaic ritual in traditional Iroquoian society, which consisted of play-acting parts of an evil future, foreseen in a dream, in the hope that the partial fulfillment of the dream in the performance would satisfy whatever was at work in the secret order of events, so that the full evil portended by the dream would no longer have to be play out. I have written about this in Dreamways of the Iroquois. Bizarre though it may sound, I have seen this method work. Back to Mark Twain, and his terrible dream of Henry laid out in a casket, with the bouquet of roses on his chest. Could the methods described above have enabled Sam Clemens to help his brother to escape the "dead room" in Memphis? Of course, we cannot know. But I feel quite certain that Mark Twain would have been willing to give the Active Dreaming methods summarized above a better-than-college try, had he known about them. 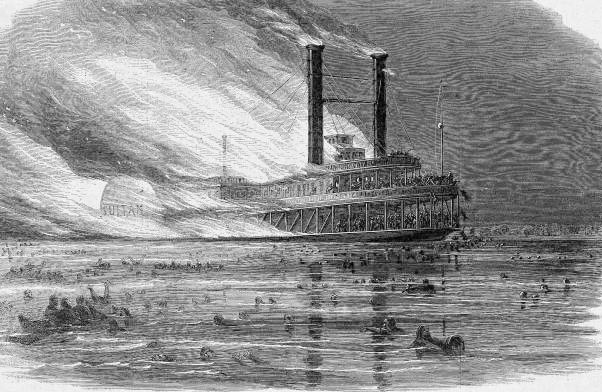 Had he not allowed his family to talk him into dismissing his dream as "only a dream", careful analysis might have drawn him to think about possible scenarios for death along the river, of which the most likely for someone working on a riverboat, in those days, was a boiler explosion of the kind that caused Henry's death. 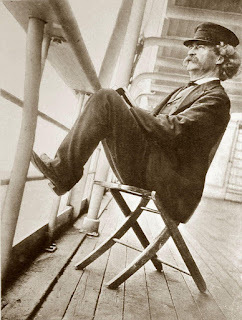 Through dream reentry, Mark Twain might have been able to establish how the death scene came about, and might then have been able to take action by counseling his brother not to travel, separated from him, on the return voyage upriver with the rage-filled pilot. Mark Twain paid close attention to dreams and coincidence throughout his life and was keenly interested in improving his practice. In my Secret History of Dreaming, I describe how he returned, in his later fiction, to his regrets that he had not gone ahead and staged a kind of dream theater at home to help his beloved daughter Suzy lift the oppression of dreams in which she was being pursued and eaten by bears, dreams that may have portended her tragic death from illness but could also have been the key to healing had they been fully heard and acted upon. For more on Mark Twain's dreams and his study of coincidence and what he called "mental telegraphy," please read the chapter titled "Mark Twain's Rhyming Life" in my Secret History of Dreaming, published by New World Library. In Birth of a Poet, William Everson raised a clamorous appeal for poets to reawaken to their shamanic calling: "O Poets! Shamans of the word! When will you recover the trance-like rhythms, the subliminal imagery, the haunting sense of possession, the powerful inflection and enunciation to effect the vision? Shamanize! Shamanize!" Across the centuries, many of our greatest poets have recognized their kinship with the shaman’s way of shifting awareness and shapeshifting reality. As his name in a spiritual order, Goethe chose the name of a legendary shaman of antiquity, Abaris, who came flying out of the Northern mists on an arrow from Apollo’s bow. Our earliest poets were shamans. Today as in the earliest times, true shamans are poets of consciousness who know the power of song and story to teach and to heal. They understand that through the play of words, sung or spoken, the magic of the Real World comes dancing into the surface world. The right words open pathways between the worlds. The poetry of consciousness delights the spirits. It draws the gods and goddesses who wish to live through us closer. My favorite Inuit shaman-word is the one for "dream". It looks like this: kubsaitigisak. It is pronounced "koov-sigh-teegee-shakk", with a little click at the back of the throat when you come to the final consonant. It means "what makes me dive in headfirst." Savor that for a moment, and all that flows with it. A dream, in Eskimo shaman-speech, is something that makes you dive in headfirst. Doesn’t this wondrously evoke the kinesthetic energy of dreaming, the sense of plunging into a deeper world? Doesn’t it also invite us to take the plunge, in the dream of life, and burst through the glass ceilings and paper barriers constructed by the daily trivial self? Shamans know further uses for poetry. They use song and poetic speech call the soul back home, into the bodies of those who have lost vital energy through pain or trauma or heartbreak. From their own journeys, they bring back poetic imagery that can help to shapeshift the body’s energy template in the direction of health. Mainstream Western physicians agree that the body believes in images and responds to them as if they are physical events. By bringing the right images through from the dreaming, the poets of consciousness explain dis-ease in ways that help the patient get well, and interact with the body and its immune system on multiple levels without invasive surgery. After attending healing sessions of Cuna shamans in Panama, French anthropologist Claude Lévi-Strauss explained how the poetry of consciousness is a healing art. "The shaman provides the sick...with a language, by means of which unexpressed, and otherwise inexpressible, psychic states can immediately be expressed. And it is the transition to this verbal expression which induces the release of the physiological process." Instead of giving an explanation of disease that leaves the sufferer powerless and "patient", the shaman explains disease through words and images that help the body get well - just as our dreams do. This is healing through dream transfer, a poetic act. Let's recall the Inuit wisdom that with the poetic act, the worlds are joined and the sacred beings come dancing through. An old Inuit woman on Little Diomede Island explained to a Danish anthropologist that powerful spirits - like the spirit of the whale - must be summoned by "fresh words". "Worn-out songs" should never be used when you are trying to call on important spirits. My new online adventure with The Shift Network, "Living Your Mythic Edge", is, above all, an invitation to become a poet of consciousness. Have you dreamed of having to take an exam for which you are not prepared? If so, you are not alone! This is one of the most common dream themes. When it comes up in my own dreams, or in dreams people share with me, I am always reminded that we are in the school of life, and are set many tests. I also look closely at the details of a dream to see of there is guidance to handle a specific test that is coming up. If you are literally in school, at any level, you don't want to miss the possibility that your dreams are coaching you for coming tests in quite literal and specific ways. I did very well in history exams in my last year in high school because I dreamed some of the essay topics that would be set ahead of time and was able to adjust my last-minute preparation accordingly. I mentioned this when I gave a luncheon talk at the Bermuda Rotary some years ago. The British Governor and his lady were present for my talk, along with yachtsmen, financial moguls and past and present members of the island government. An elegant black Bermudan lady, until recently the island Minister of Education, stood up at the end of my remarks and declared, "I want to endorse the statement by Mister Moss that we can dream examination questions ahead of time. This helped me greatly when I was in school. I recommend that anyone who knows a student should pass this advice along." "When he was at Cambridge Dr. Peile of Christ's offered [Budge] an exhibition if he would be examined in Assyrian, and as Budge's funds were exiguous he was very anxious to get the exhibition. An examiner, Professor Sayce of Oxford, was found to set the papers--four in all-- and the days for the examination were fixed. "The night before the day of the examination Budge dreamed a dream in which he saw himself seated in a room that he had never seen before--a room rather like a shed with a skylight in it. The tutor came in with a long envelope in his hand, and took from it a batch of green papers, and gave one of these to Budge for him to work at that morning. The tutor locked him in and left him. When he looked at the paper he saw it contained questions and extracts from bilingual Assyrian and Akkadian texts for translation. The questions he could answer, but he could not translate the texts, though he knew them by sight, and his emotions were so great that he woke up in a fright. At length he fell asleep, but the dream repeated itself twice, and he woke up in a greater fright than before. "He then got up--it was about 2 A.M.--went downstairs to his room, lighted a fire, and, finding the texts in the second volume of Rawlinson's great work, found the four texts and worked at them till breakfast-time, when he was able to make passable renderings of them. 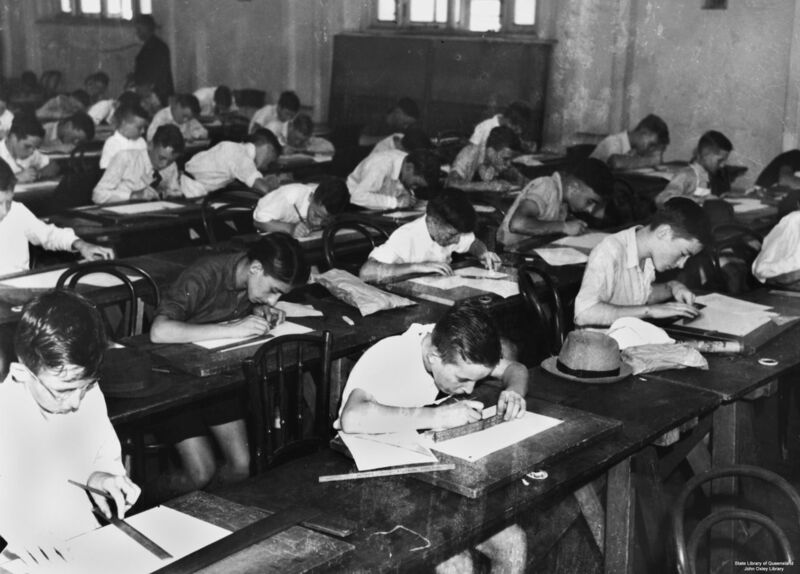 "He went to College at nine, and was informed that there was no room in the Hall, it being filled by a classical examination, and that he must go into a side room near the kitchens. His tutor led him to the room, which was the duplicate, skylight and all, of the one he had seen in his dream. The tutor took from his breast pocket a long envelope, and from it drew out several sheets of green paper similar to that of the dream, and gave Budge the examination paper for that morning, saying that it was green because Sayce, on account of delicate eyesight, was obliged to use green paper when writing cuneiform. The tutor then turned, said he would come back at twelve, and, going out, locked the door behind him as Budge saw him do in the dream. "When he sat down at the table and looked at the paper he saw written on it the questions and four pieces of text for translation, and the texts were line for line those which he had seen in his dream. Surprise at his good fortune prevented him from writing steadily, but at length he got to work and had finished the paper before the tutor appeared and unlocked the door at noon. The three other papers were easier, and Budge got the exhibition--for him a very vital matter." 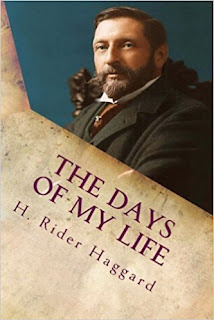 Rider Haggard asked Budge if he could explain how a dream prepared him in such a specific way for the unusual conditions of his exam in Assyriology. Budge replied, '"No. My mother and maternal grandmother both had dreams of this sort from time to time when they were in any kind of difficulty, and in their dreams they were either shown what to do or were in some way helped. Being very pious folk, they regarded these dreams as the work of Divine Providence, who wished for some reason to help them out of trouble or difficulty. For myself, I could never imagine Providence troubling about any examination, but I was quite overcome for a time with astonishment at my good luck.'" My own explanation is that in dreams, part of our consciousness - indigenous cultures call it the dream soul - is forever scouting ahead of us, preparing us for situations that lie ahead. We did not have the term “near-death experience” (NDE) when I kept dying and coming back as a young boy. The first edition of Raymond Moody’s book Life after Life did not appear until 1975, twenty years after I left my body in St Andrew’s hospital in Melbourne and flew through the Moon Gate to live a life in another world while my body lay under the surgeon's knife. If the phenomenon now called NDE had been recognized earlier, it might have been easier for me to have been heard and understood by those around me. It would have been helpful to me to know that many others in Western society have reported profound experiences of leaving their bodies and that this is widely recognized as evidence that the soul can travel outside the body and that there is life after physical death. There is a statement in Life after Life that spoke to me deeply when I eventually got to read it: “Once the dying person reaches a certain depth in his experience, he does not want to come back, and he may even resist the return to the body.” This was certainly part of my story. Moody argues in Life after Life that “the similarity of so many of the accounts” is a reason for believing reports of NDEs. But when I read the cases he assembled, and then hundreds of other reports from Near Deathers, I did not find many close “similarities” to what I experienced when I was nine, and seemed to live a whole life in another world. The stories that spoke to me were from ancient and indigenous cultures, from folklore, and from Eastern traditions. When I discovered George MacDonald’s tales of Highland seers and ghosts, I found a phrase that spoke very directly to my experience of trying to live in the ordinary world. In MacDonald’s wonderful little book The Portent: A Story of the Inner Vision of the Highlanders Commonly Called the Second Sight, the woman who nursed the narrator reveals details of his strange birth and his possible connection with a tragic drama played out in an earlier time. The nurse has the gift of second sight; she sees things happening at a distance, and moving between dimensions. She cautions Duncan that he will never be “either folk or fairy”. I did not remember quoting this phrase as a young boy. I doubt that it would have helped me communicate with those around me. 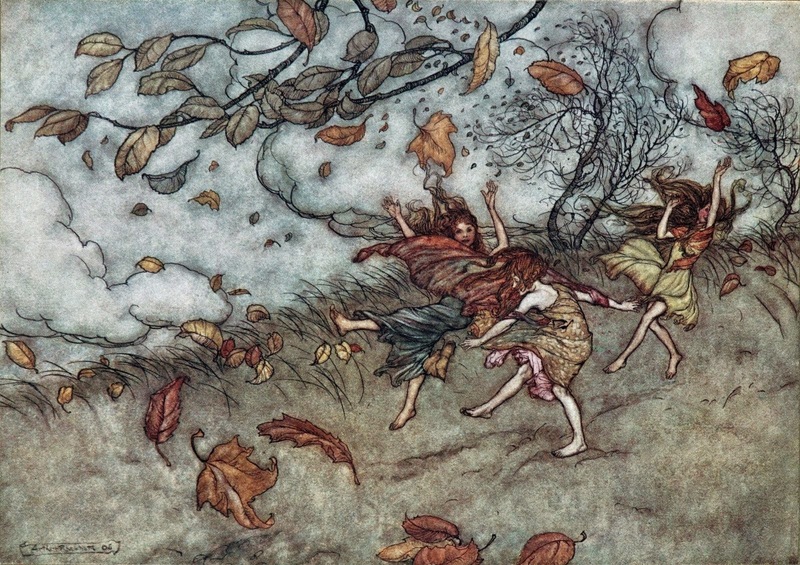 But the notion that one may be “neither folk nor fairy” – but something of both” – helped me to explain things to myself. In MacDonald’s “faery romance,” Phantastes, the book C.S.Lewis said “baptized” his imagination, the room where the protagonist is sleeping turns into an enchanted forest overnight. Water spilling from a green basin becomes a little river. The floral patterns of the carpet become wildflowers and grasses along its bank. When he follows it into the woods, he is in Fairy Land. He is welcomed and fed by a friendly woman in a cottage of living trees, and knows she must be at least part human because she is awake during the day, when the fairies sleep. But she is something else as well. She must live close to fairies, and eat a little of their food, or else she will always be hungry. This became a pattern for me, since I went away. I found that the gates of the Otherworld opened from wherever I happened to be, and that I went hungry unless I stayed near its people and shared some of their food. I never had trouble staying awake in the night, or sleeping in the day. 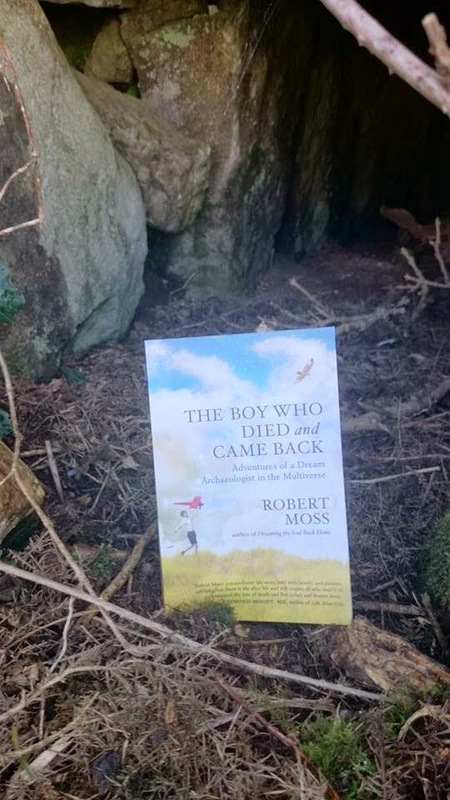 - Excerpted from The Boy Who Died and Came Back: Adventures of a Dream Archaeologist in the Multiverse by Robert Moss. Published by New World Library. “You know what a master is like,” she cautioned me. I climbed the last steps to the master’s hermitage resolved not to submit to any slap-in-the-face treatment. I found him with his feet in a tub of hot water. Steam rose and the air was pleasantly scented with mountain herbs as one of his handmaidens palpated his feet. I was curious to see whether she would dry them with her lustrous black hair, that fell to the floor. “Move the chest,” he directed me. I contemplated the great iron-banded box without enthusiasm. He indicated the far corner. I half-lifted, half-carried the heavy trunk to the place he indicated, wondering what he kept in it. I felt the veins bulge on my forehead as I struggled to carry out these instructions. I nearly made it back. Then the trunk slid from my grip, landing painfully on my left foot. I realized, at that moment, that the master’s eyes were closed. I understood that I was to close my own. I felt the stir of movement. I heard the swish of the loose silk of his garment, and pictured his arm swinging back, fist clenched. Here it comes. I intended to duck the blow, but something kept me in place, on my knees in front of him. What was that buzzing sound? It made me think of a bee, trapped behind glass. It came closer. I felt burning pain as something pierced me at the third eye, like a drill bit. Immediately the girl was at my side, soothing my forehead with an ointment that smelled like yoghurt. When she left off, there was absolute stillness in the cabin. Then I heard the soft slap of water from the footbath. I opened my eyes. There was no change in the scene. The black-haired girl squatted at the master’s feet, as before. I felt no surge of enlightenment. I did notice that one of the master’s eyes was now open. Above and between his closed eyelids, it fixed me with its blue light, cold and unwinking. I wrote this little story during a 15-minute timed exercise while leading an adventure in "Writing as a State of Conscious Dreaming". It appears here unedited. The starter dough was a card I drew in a literary version of my Coincidence Card Game that included the words "third eye. "I am leading "Writing as a State of Conscious Dreaming" again this year at magical Mosswood Hollow, near Seattle, from May21-25 and in a green paradise near Česká Skalice in the Czech Republic from September 12-16. 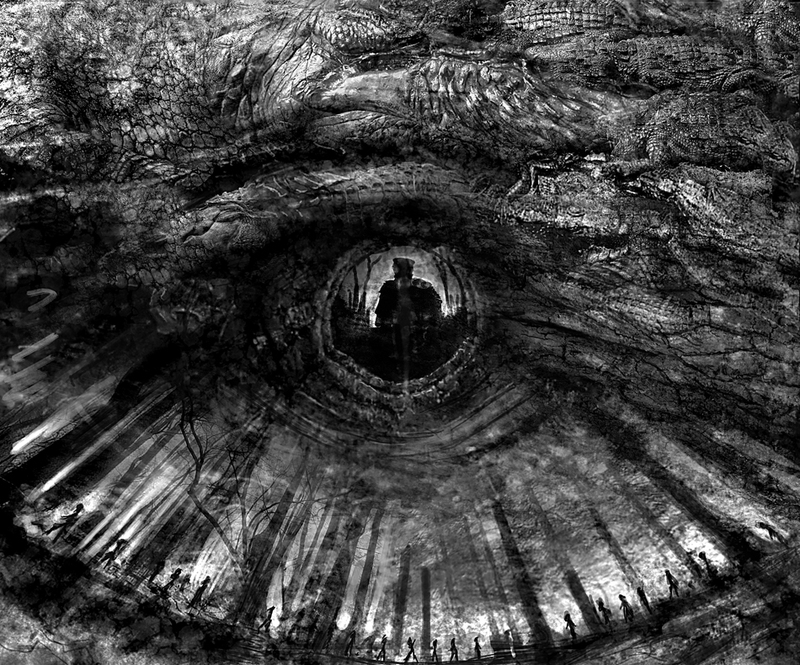 Image: "Watching" by Zen-Master on DeviantArt. From the horizon there rose up to the sky, like a whirlwind or a waterspout, a tall black column. Its outline was indistinct, but from the first instant it could be seen that it was not standing still, but moving with fearful rapidity, moving straight towards Kovrin, and the nearer it came the smaller and the more distinct it was. When Kovrin makes way for it, it turns into a monk, dressed in black, with gray hair and black eyebrows set in a “fearfully pale” face. Arms crossed over his chest, the monk glides above the rye for twenty feet, never touching the ground. Then he turns and nods before he expands again, passes through the landscape and vanishes like smoke. Later the monk in black turns up for conversations with Kovrin. They sit together on a park bench, or in a room. 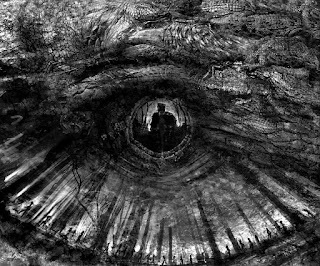 Kovrin’s man in black assures him that he is a genius who is working in the cause of the "kingdom of eternal truth", in which the highest value and pleasure is wisdom. He discloses early on that he is a “phantom” of Kovrin’s imagination, then adds that the products of imagination are “part of nature” and so he is also quite real. 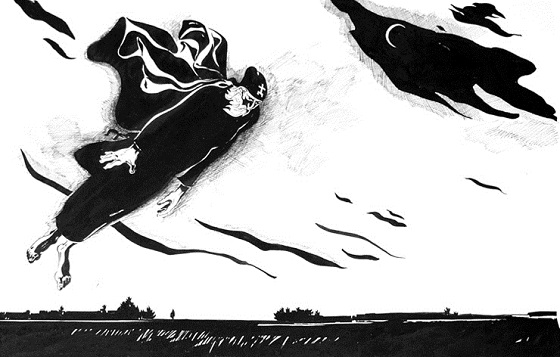 When Kovrin questions his own sanity, the phantom tells him to be bold in accepting the price of creative genius. Normality is the state of the herd; gifted people are hardly normal and often near madness in the eyes of the world. Kovrin is spurred to work day and night on his books and researches. Alas, his new wife wakens in the middle of the night to catch him talking to himself. When he explains that he is actually talking to a monk in black, she declares that he is mentally ill and must seek help at once. Carted off to the country, doped with bromides and stuffed with food, force-fed milk instead of his wine and good cigars, Kovrin stops seeing and hearing the black monk. He also loses his gifts and his brains and is soon spitting blood. He goes fast downhill, wasting his years. He leaves the wife who pushed him on this course, but it’s too late to halt his own decline. He sees the whirling monk just once more, at the moment of his early death, just before his life’s blood spews from his lungs and mouth in a terminal hemorrhage. I was struck by the way the "black monk" appears, rises in the distance like a tornado, or a whirlwind, very much like a desert jinn, before he assumes human proportions as he approaches Kovrin. I felt sympathy between the author and this jinn-like monk. Dr Chekhov knew all about the symptoms of tuberculosis. He died of it, at 44, as did his brother before him. "I have everything in order except my health," he told Olga Knipper just before their wedding. One of the cures that failed to fix Chekhov was large infusions of fermented mare’s milk. The autobiographical element in “The Black Monk” is strong. Chekhov wrote it in the summer of 1893 at his country estate at Melikhovo, which his disease later forced him to give up. That summer he took a very keen interest in gardening (like the obsessive Pesotsky in the story) spending hours minutely examining roots and fruits and vines. He also took time that summer to expand his knowledge of clinical approaches to mental illness, with the help of Russia’s leading psychiatrists of that era. 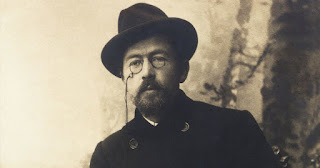 Chekhov transferred to his character Kovrin his symptoms, and his dream of the monk in black, and also his keen awareness of how life can present wrenching life choices. Is it possible that Chekhov contemplated a different ending for “The Black Monk”? Might the act of imagination involved in that have helped the author as well as his character? I am starting to imagine that alternative ending. Kovrin decides to defy the world and live the creative life the phantom promises. He sends his wife home to her father – who is as obsessive as Kovrin, but in a different way, with dirt under his fingernails from his experiments in horticulture and his orchard-tending. Kovrin writes and publishes all those books and gives those lectures that amaze Moscow. He trusts the black monk’s assurance that his genius is real, and great enough for him to do the all-but-impossible things. How would the story have run then? The author would need to choose between forking paths, once again. Kovrin could die in a torrent of blood as he did before, seen by the world as either the very model of the romantic hero wracked by consumption – or as a vampire lord spewing up his night feasts – or as a madman whose scripts must be anathematized and burned. Or he could come through well in all ways, healed by living all of his creative assignment. In any of these versions, I would want to see the author amend his title. The story should surely be called “The Monk in Black” (as in “men in black”) rather than “The Black Monk”. 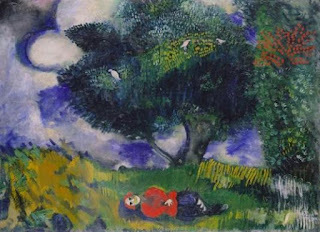 Maybe someone in this moment is digging in an old cherry orchard, near Chekhov’s country estate, and is startled by the chink as his spade clips a buried trunk containing the manuscript of the other “Monk in Black” (the version that also got the title right). Writers enjoy the thrill of petty larceny. Though I don’t recommend grand theft, I encourage people at the start of my creative writing programs to borrow lines, images and plot ideas from each other. At the beginning of one of my 5-day adventures in "Writing as a State of Conscious Dreaming" at Mosswood Hollow, we accomplished this through a card game. I had everybody write a summary of a dream or a story or just a few good lines on one side of an index card. Then we took turns to pull cards from the deck and make up more of a story or script from whatever was dealt to us, pretending that the card we drew contained our own material. We also agreed that whatever was read in front of the group would be common property. This provided great starter dough! Here is a cycle of seven little verses I wrote that morning, riffing on seven of the cards that were shared. till she didn’t know which way to turn. until she turned all of them off. what you most fear is what you must do. On the porch, a few of us are fanning ourselves. Most are torpid in sunlight, in a heat stupor. and we rise to follow, filling the air with our hum. on the dew-glistening grass, sweet and soft. talons exquisitely precise. Breakfast time. To tell you I love you is to love myself. until all roads lead to my heart, and you. that calls you now, all these decades gone. Take the U Train, you. The card game mentioned above is a literary variant of my Coincidence Card Game, whose rules are fully explained in Sidewalk Oracles. I am leading "Writing as a State of Conscious Dreaming" this year at magical Mosswood Hollow from May 21-26 and at a beautiful country hotel near Česká Skalice in the Czech Republic from September 12-16.